The best cheap gaming chair deals you can find right now, to let you lounge in luxury while you play. Finding cheap gaming chair deals can be a tough racket, because a lot of the models only very rarely go on sale, and the vast majority of those seats that are discounted are on clearance because they're trash. That said, if you look hard enough and peek under enough rocks, you can find some pretty incredible deals on even the most premium gaming chairs, so we combed through every retailer to find discounts on some of the best gaming chairs. Getting a great chair not only improves your quality of life while you play, but can actually up your game, letting you focus on headshots rather than the kink in the small of your back or how much your neck aches. Secretlab's Omega is still available at an excellent price, currently only $329 from Secretlab in the US (a massive $111 off). It's one of the most comfortable, adjustable, durable chairs we've ever had the pleasure of testing, and it's currently parked at the very top of our best gaming chair roundup. 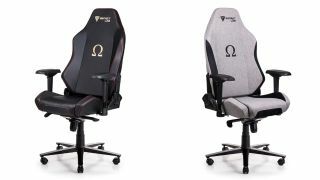 Rated our best gaming chair of 2019, the Secretlab Omega is currently on sale for 27 percent off. You can head on over to the Secretlab website to pick one up while the sale lasts. Few gaming chairs can mix both style and comfort, but the Omega does just that. It's shaped to support every part of your back, and the additional lumbar pillow and headrest mean that you can get whatever support you need while sitting in a chair that not only classes up a gaming set-up, but also sits very comfortably in an office environment too. What's more the controls feel both well-made and easy to use. Some chairs save money in the plastic parts on the arm-rests and levers, but the ones on the Omega feel sturdy and easy enough to push into place. In fact, once you've actually put the chair together (get a friend to help) it all feels very solid and well crafted. The Omega itself is probably a little expensive at full price, but Secretlab often reduces the price by about $100/£100, so this is the ideal time to pick one up. The Epic comes in a variety of tasteful colors too, something that many gaming chairs should take note of, and all the trimmings feel well made and worth the money. There's a lovely, precise tilt mechanism here to help you recline, and good support for both neck and lumbar. A nice chair, if you can afford it or find a decent deal.